Comes February, 2015, an ape may win the Best Actor Oscar as Andy Serkis gets first billing as Caesar deservedly if nothing else but for the acting he does with his eye. Very close behind him is Toby Kebbell as Koba, another ape. None of the actors playing humans such as Jason Clarke, Gary Oldman, Keri Russell and Kodi Smit-McPhee stand a chance when they are on screen with the aforementioned apes or the other ape actors like Judy Greer, Karim Konoval and Nick Thurston. 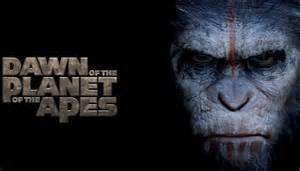 First and foremost I must emphasize that “Dawn of the Planet of the Apes” must be seen on the BIG movie screen just as “Gravity” had to be seen in a movie theatre to really be appreciated. The only other ‘Ape” movie I have seen was the very first in 1968 and just the production values from makeup to costumes to special effects since then is a show in itself. It is beyond my comprehension how visual effects supervisors Joe Letteri and Dan Lemmon achieved what they do in this movie. The direction gets the strong hand that it needs from Matt Reeves. The script writers Mark Bomback, Rick Jaffa and Amanda Silver follow the trend and true westerns of the past with bad guys and apes versus good guys and apes, including a high noon shoot out and a major draw dropping fight out between the hero and villain--no, not who you think! The bottom line is that “Dawn of the Planet of the Apes” has to be seen in a movie house on the large or it will be just another meaningless movie. Get ready for an ape to win the major acting prizes!